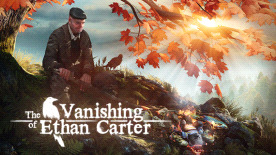 The Vanishing of Ethan Carter is a first-person story-driven mystery game that focuses entirely on exploration and discovery. It contains no combat or explosions of any kind. If our game leaves any scars, we hope you won’t be able to see them. Still, the discoveries won’t happen on their own, or without your help. Using both Paul’s supernatural skill of being able to communicate with the dead, and your own powers of observation, you will discover the mystery behind a trail of corpses, the roots of a dark ancient force lurking in Red Creek Valley, and the fate of a missing boy. Explore and interact with the beautiful yet ominous world of Red Creek Valley, which was created with the use of revolutionary photogrammetry technology that allows for nearly photorealistic environments. Communicate with the dead and see how they died in order to gather clues that help you piece together the truth behind Ethan’s disappearance -- and the fate of his family. Experience, in non-linear fashion, a story that combines the pleasures of pulp, private eye, and horror fiction, all of it inspired by writers such as Raymond Chandler, Algernon Blackwood, Stefan Grabinski, and H. P. Lovecraft. Conduct the investigation on your own terms and at your own pace. Although there are a few scary bits in the game, players will have no need for sedatives. Our game is less about terror and more about clammy unease.